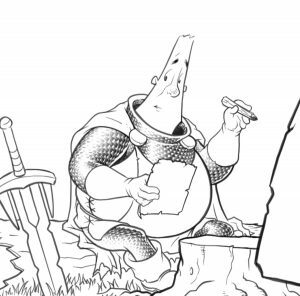 Thanks to 100+ supporters on Patreon, The Middle Age is now updating twice a week – Mondays and Thursdays. Here’s a look at where and when you can find new episodes. Please note that the times are approximate and – depending on my appearance schedule – may be quite a bit different. 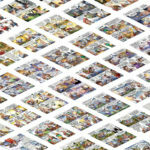 GoComics – GoComics Premium subscribers receive an e-mail with new episodes of many of the best webcomics and classic newspaper comics like Calvin & Hobbes and Peanuts. Ninety-eight episodes – even through two hurricanes! 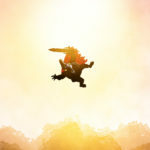 An Eisner Award nomination for “Best Webcomic”! Three Ringo Awards nominations – two for “Best Webcomic” and one for “Best Cartoonist”! 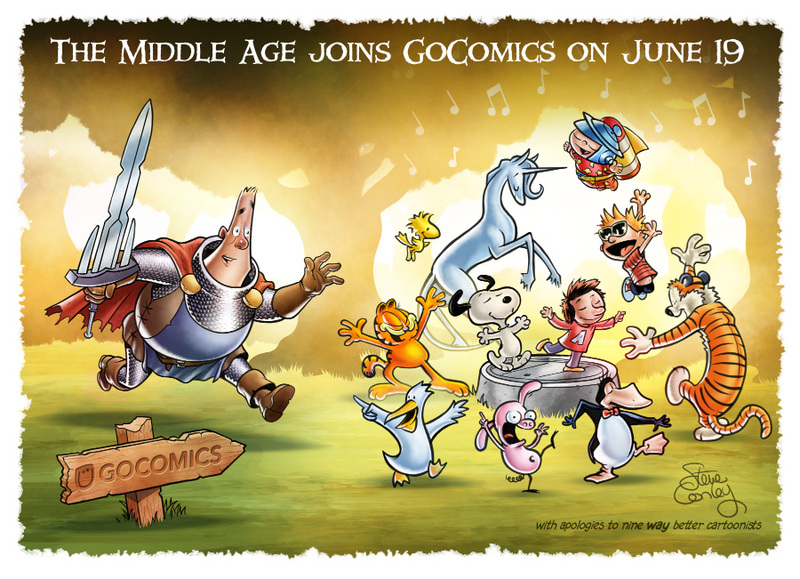 The Middle Age was picked up by GoComics, showing our hero’s adventures alongside my favorite comic strips including Calvin and Hobbes, Cul de Sac, Peanuts, and Garfield. There are now three small, softcover collections of the individual chapters! 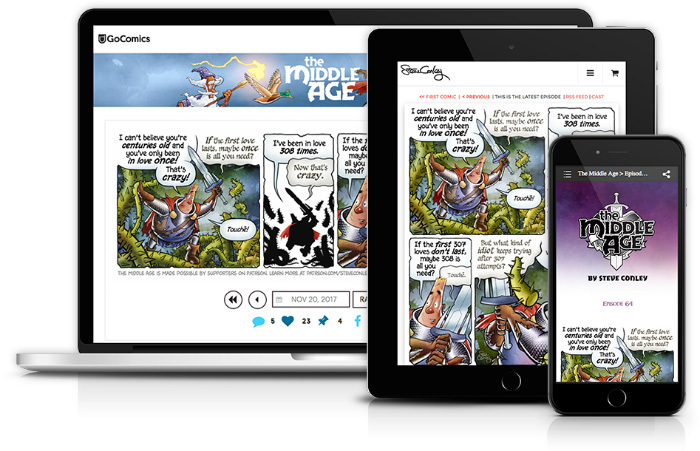 The Middle Age now has more than 3,000 subscribers across GoComics, Webtoon and Tapas. 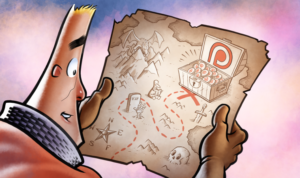 There are now sixty supporters on Patreon – and we’re getting ever closer to increasing the strip’s frequency to two days a week! 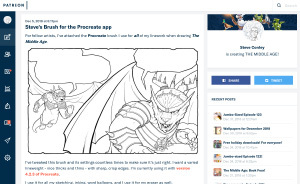 Not bad for a silly comic strip about an older knight, a sarcastic sword, and two baby dragons. So what’s the plan for year three? 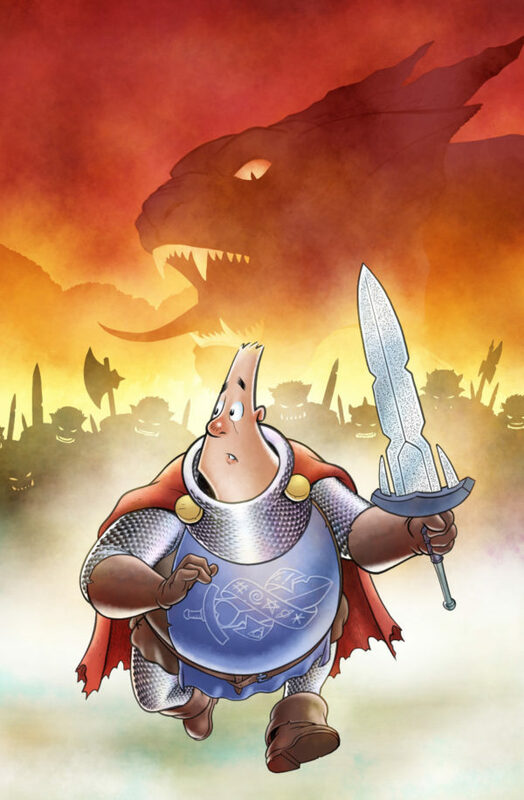 New stories set in the world of The Middle Age! 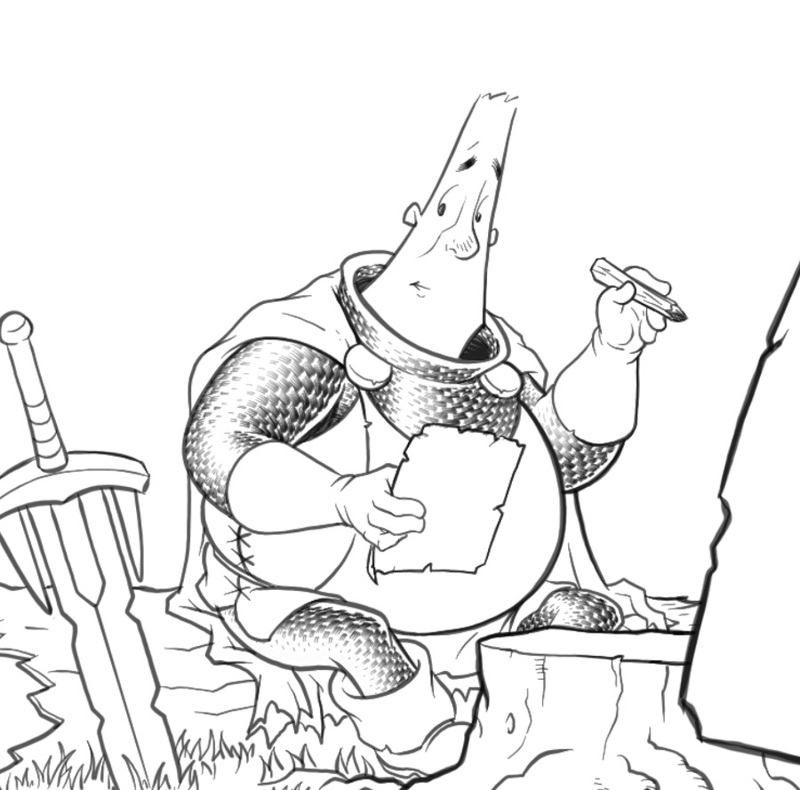 Starting today, to give readers even more reason to become Patreon supporters, I’m uploading exclusive-to-Patreon comic features – most of which will be set in the world of The Middle Age. These stories aren’t part of the main Sir Quimp storyline but will help flesh out the universe and give me a way to play in the world without slowing our hero down. 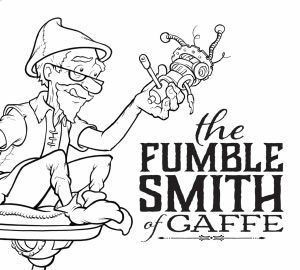 The first one, “The Fumblesmith of Gaffe” starts today. 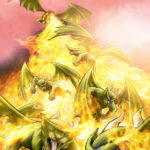 Upcoming features will look at the cultures of dragons, the 12th War, the magic of sandwiches (nibblemancy), and Fadoodle and Fleak, Agents of the Department of Cosmological Chicanery and Metaphysical What-Have-You. A hardcover collection of the first three chapters! 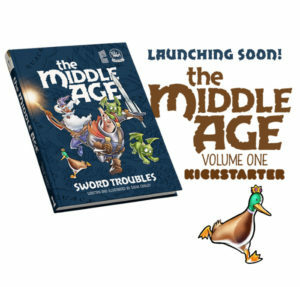 Next week, I’ll be launching a Kickstarter to collect the first three chapters in a single hardback volume! 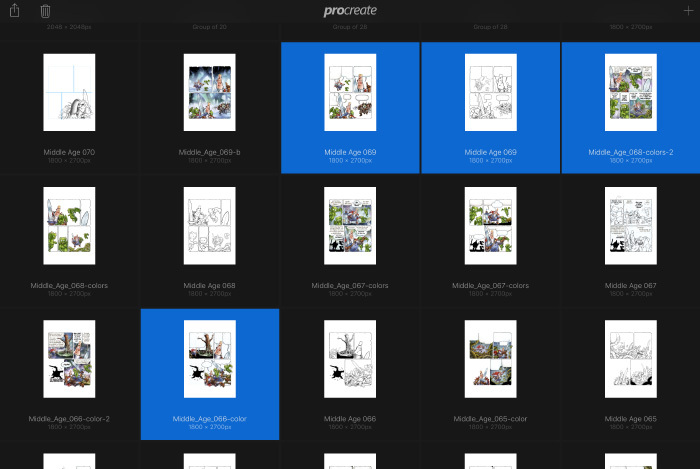 I’m super-excited for the new format because it will show the work at a much larger size than the individual, single-chapter softcover editions! And there will be t-shirts, a new enamel pin, and other cool loot. Stay tuned. 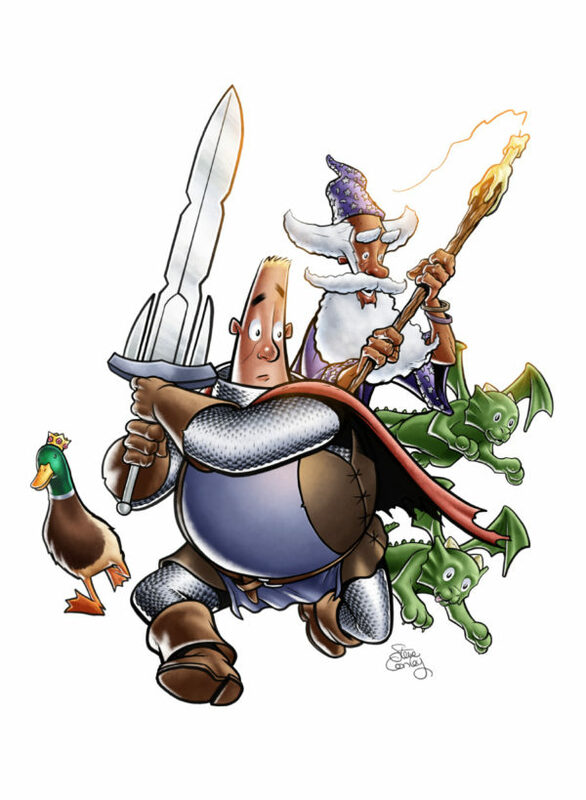 Thanks to everyone who liked, shared, retweeted, commented, backed, shopped and/or became patrons of The Middle Age during the first two years. I’ll keep working to make silly comics worthy of your kind support. 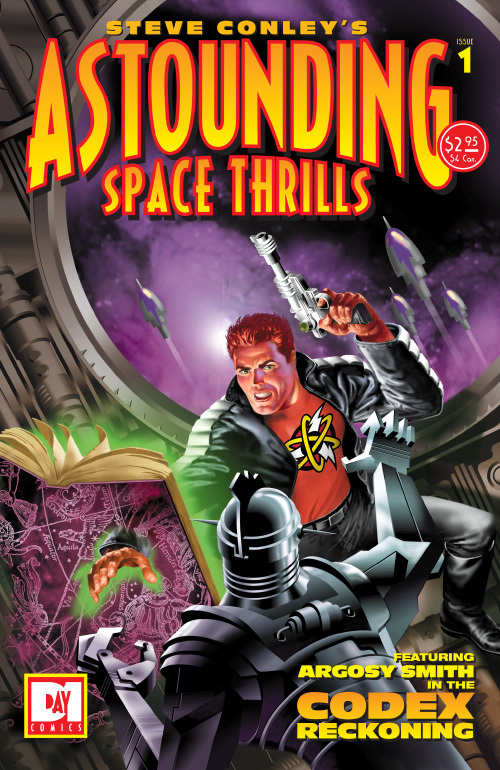 This year marks the 20th anniversary of my webcomic and comic series Astounding Space Thrills. 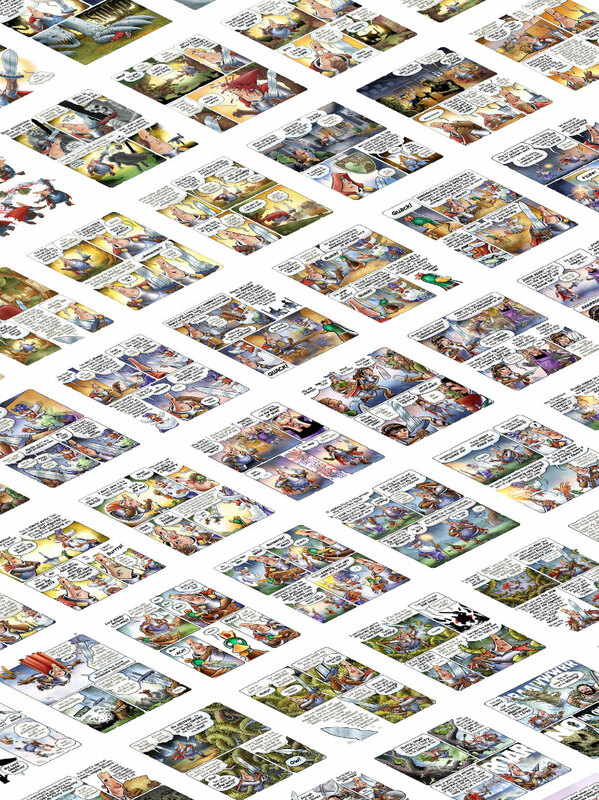 To celebrate, I’m prepping and re-releasing the original comics with a 20th anniversary Omnibus Kickstarter planned for later this year (please sign up for my email list if you want to be alerted when the Kickstarter goes live). 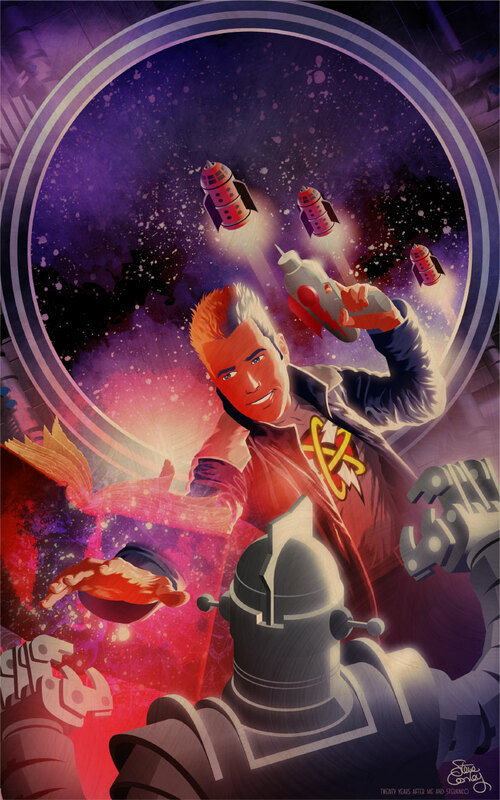 Here’s a look at the cover for the new collection of Astounding Space Thrills: The Codex Reckoning and Aspects of Iron. The figure and textures were painted in Procreate with vector-drawn elements imported from Photoshop. I’m really happy with how it turned out. This collection reprints the first three black-and-white issues of Astounding Space Thrills. The remastered web series can be read here (with updated installments on Tuesdays and Thursdays). You can read about the original 1998 cover collaboration with Jim Steranko here. 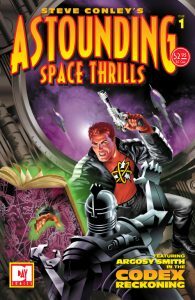 This year marks the 20th anniversary of my comic book and webcomic series Astounding Space Thrills. 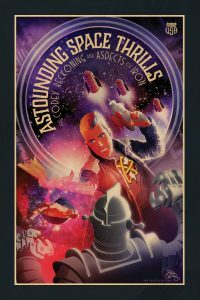 This year, I’ll be producing an omnibus edition collecting all the AST stories into a single volume. The omnibus will be available through a Kickstarter campaign, so be sure to follow me on social media or, better yet, sign up for my mailing list to be informed when the Kickstarter launches and snap up the limited awards and early-bird discounts. 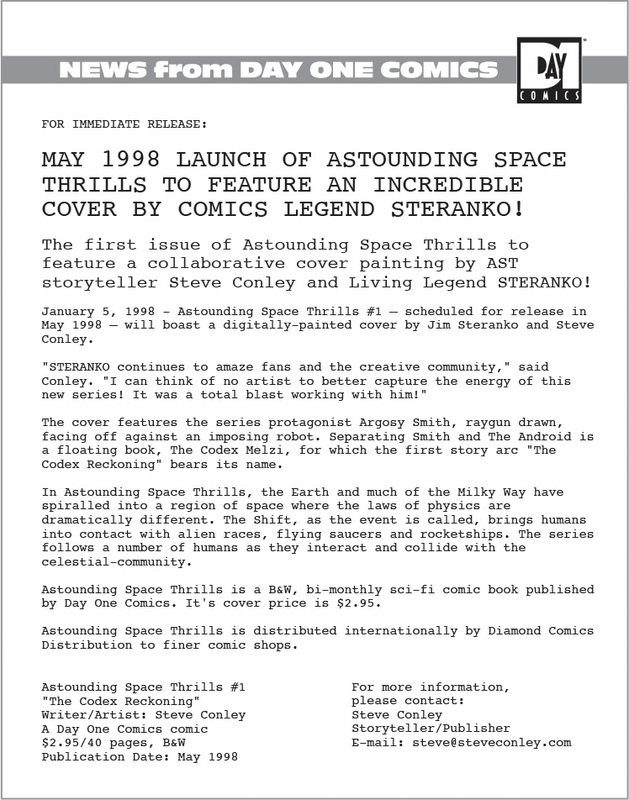 Twenty Years ago today, on January 5, 1998, I sent out a Press Release announcing the upcoming first issue of the Astounding Space Thrills comic book. The big news was that the cover featured work by legendary artist Steranko. It’s still all true! Here’s a look at that cover. 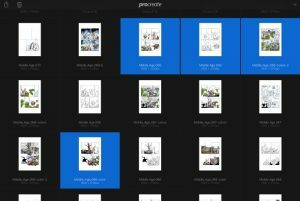 Webcomic Formatting: Can I future-proof my webcomics? If I want to reach the widest possible audience, I can’t let technology or format stand in the way of a new reader. What I’m doing to address this: I work at a high resolution in a flexible format. 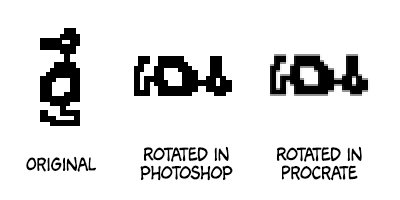 I design my comics with rather big lettering to work in three basic shapes – horizontal, squarish, and vertical. Standard-resolution stacked format (~600-pixels wide) for this site and for social media (Facebook, Twitter and Instagram). 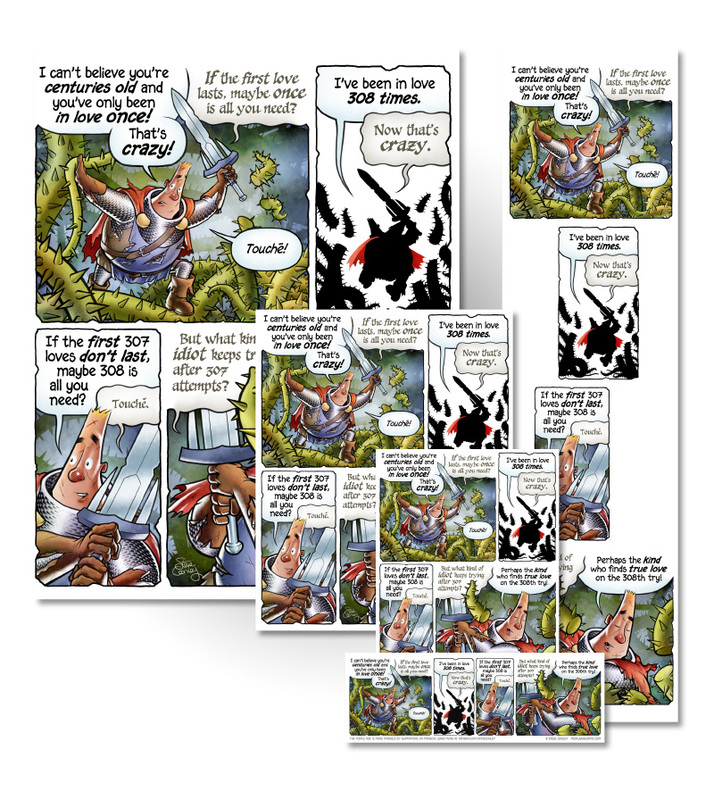 Horizontal format for GoComics – this was the starting place for my design. It’s the exact same shape as a Calvin and Hobbes comic strip. I recently added the vertical, scrolling format and the response from the mobile-centric Webtoons audience was overwhelmingly positive. In the end, if I want to create stories that last, I must create them in a format (or formats) that will last. In other words, the only acceptable reason for someone not reading my comics is that they just don’t like my comics. I hope this occasional bit of shop talk will be useful to others working on their own webcomics. If you find it interesting or helpful, let me know! The Middle Age and Steve receive Ringo Awards nominations! I am thrilled to learn that I’ve been nominated twice in the inaugural Ringo Awards. 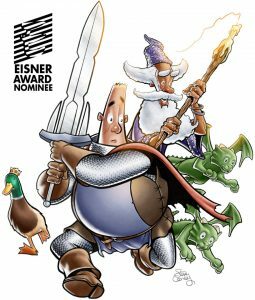 The Middle Age received a nomination in the ‘Best Webcomic’ category and I was nominated in the ‘Best Cartoonist (Writer & Artist)’ category. A lot of comics are created by teams of artists and the ‘Best Cartoonist’ award is for creators who write and draw their own stories. 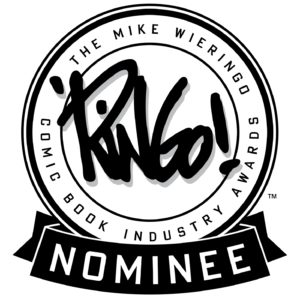 The Ringos (or The Mike Wieringo Comic Book Industry Awards) are named after Mike Wieringo, a wonderful artist we lost ten years ago. I had only met Mike a handful of times in person but we often corresponded. He was always more supportive of my work than it deserved. His kindness, professionalism, and the lively spirit of his art remain steady influences. I’m deeply honored to be nominated and I can’t say enough good things about my fellow nominees. My sincere thanks to the awards jury as well as everyone who voted in the popular categories. Thanks again or your kindness and support! 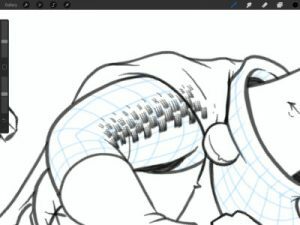 Or more specifically… how I draw chain mail in my webcomic The Middle Age. I get a lot of comments and questions asking how I create the chain mail texture in The Middle Age. 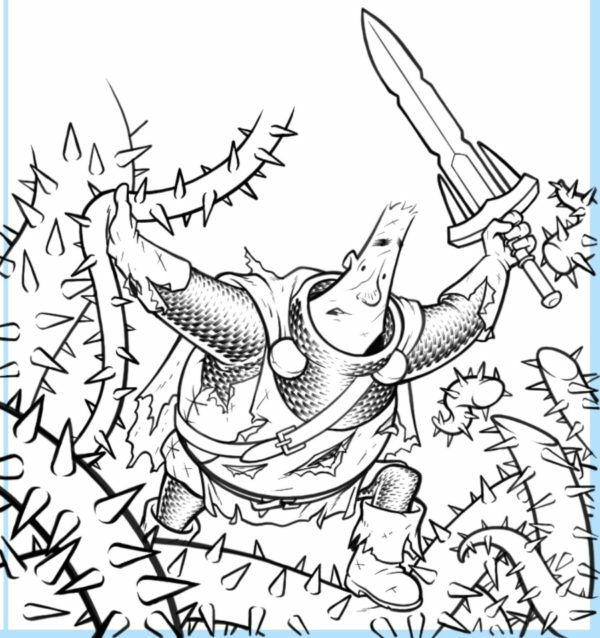 The hero of the story, Sir Quimp, wears armor that looks sort of like chain mail or banded mail armor. Artist friends have presumed it’s a special brush or a texture map or something computery. But it’s all drawn by hand, one link at a time. And it might look complicated but it’s not. 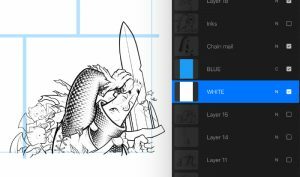 Now, I work on an iPad Pro using the Procreate App but this approach works with any software and even works with traditional pen-and-ink tools. 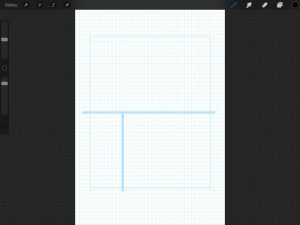 Step 1: Start by drawing a grid on the form which will act as a guide for your texture. Keep in mind the shape, perspective, folds and bends. It should look 3-D. 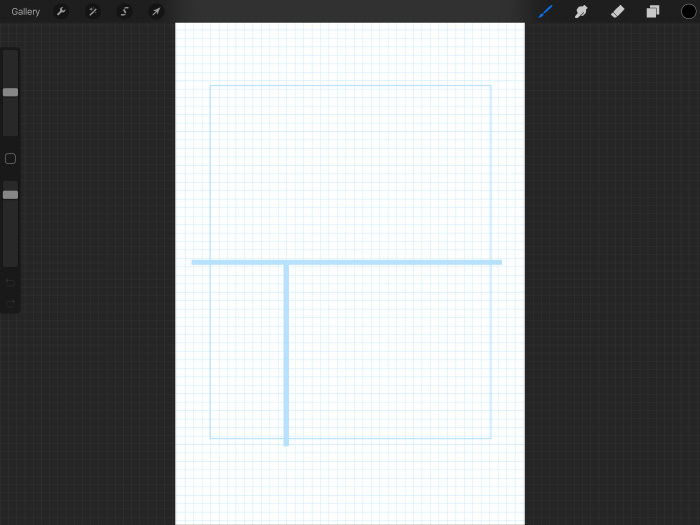 If it looks like graph-paper, the pattern will look flat. But it doesn’t need to be perfect. We’re just using it as reference and we’ll erase it when we’re done. In the example, you can see mine in light blue. 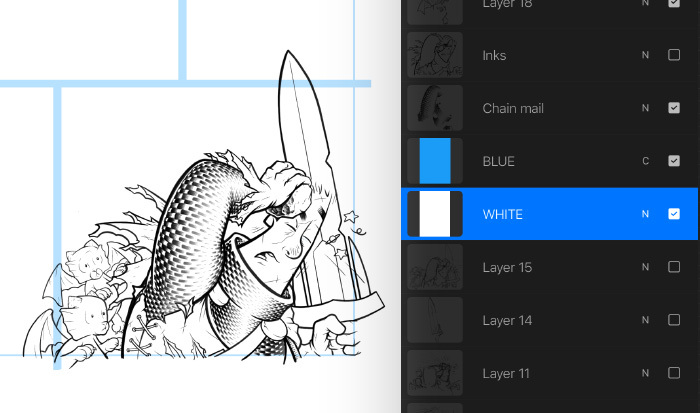 Extra tip: I draw my guides on a separate layer to make them easy to hide and delete. Step 2: Now let’s start the pattern. Somewhere around the two-thirds point on the side where light is coming from (not down the middle), draw small, single, evenly-spaced tick marks. Again, they don’t need to be perfectly spaced or identical. Do your best and that’ll be fine. Remember that this is armor wrapping a living figure, not a robot, and we expect variations. Those variations make the figure feel more alive. Extra tip: I make the texture extend a little bit beyond the shape – you can see it overlapping the cape – this helps me keep the pattern and spacing consistent. I erase the overlapping bits when I’m done. Step 3: Between each one of those tick marks, draw two tick marks next to each other. Extra tip: The longer each tick mark, the wider each chain segment will seem later. 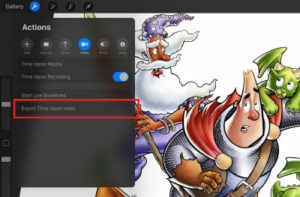 Step 4: Between each of the double-tick marks, draw three tick marks next to each other. You can see where I’m going with this. Step 5: Between each of the triple-tick marks, draw four ticks marks next to each other. And so on… until you run out of room. Always increase the number of tick marks per row and you’ll get the proper effect. Then do the same thing in the other direction. 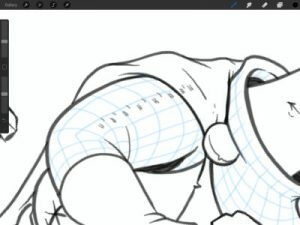 Extra tip: don’t draw all the way to the shape’s outline on one side to give a hint of really-bright side lighting. If you want to see how other cartoonists handled drawing armor textures, I recommend checking out the work of Hal Foster, Wally Wood, Russ Manning, and David Petersen. You can see plenty of examples in my webcomic The Middle Age. Scroll down to ask any questions or leave a comment. If you’d like to see more tutorials like this one, please consider becoming a supporter on Patreon.